Wisdom of Life. 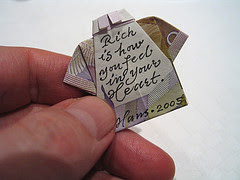 : Rich in heart. I had seen Hanafiah grew. From a young innocent man at 21, after 18 years he has developed himself to be a successful stock broker in town. Few days ago, he texts me a message, "Can you write in your blog. The longer I live in this world, the lesser friends I get. I mean, a lot of friends but so little good and sincere friends. Why?" From his words, I knew he wasn't happy and somethings must be disturbing him. Without ado, I invited him for a lunch when we had a long fruitful sharing. During our friendly chat, I started to ask this simple question, "Are you rich?" It fact this question was thrown to me a few day ago by an intelligent lady. Hanafiah replied, "Robert, you have seen me progress. I was penniless when you knew me. God has taken good care of me and blessed me with wealth from my trading. I consider myself as rich. With a little luck, I could be richer in a few months time when I might hit the jackpot." I felt happy for Hanafiah frankness. Instead I said, "You are lucky my friend. You are definitely wealthier than me. However I am rich in my heart which makes the different." By his look, I knew he did not really understand my meaning. These were my explanation to him here. To be rich in heart, one who is willing to give unconditional love to whoever he meets. Be they strangers, friends, enemies, poor or rich, young or old, man or woman. As long as they are from this planet earth. Offer your love with humbleness. Not only to the rich but to the poor as well. Be kind to the one who needs your help. Be caring to those who seek your assistance. Give without any expectation of return. Give with all your smiles. Give to those who even complain and criticize against you. Give to feel happy and joyful. Give to feel contented and fulfilling. Give to the world and make others happy. If only you could understand that by giving and making people happy because of yourself, you will feel the happiness in you too. This is what I call rich in the heart. A person who is rich in heart will see the world as beautiful as ever, because his heart is happy all the time. I told Hanafiah, you might be rich in wealth but your heart isn't rich yet. Unless he is prepared to change his perception of life. After all, love is free. The more you give away, the more you will receive. Otherwise I won't have survived this long in this selling world with so much of respect, value and trust given to me, by my clients, friends, dears and my little darling. I love them whole heartily and equally they love me sincerely too. I hope Hanafiah can accept my wisdom of life. Food for the heart - "Three things in human life are important. The first is to be kind. The second is to be kind. And the third is to be kind" - Henry James. It is easy to practise and the result is fruitful. Be Happy & Be Rich !!! I am so glad you are back after not seeing you for quite some time. Your wisdom words are always a reminder to me. Thank you for reminding.